Effortlessly locked into angular poses by some deep, unspoken trauma — this is the classic view of catatonia epitomized in grainy, monochrome images of psychiatric patients reduced to statuesque rigidity. "Ryan, who though he has the mental age of a three year old can master complex jigsaws, experienced involuntary movements and struggled to cross thresholds like doorways." But when catatonia emerges in autism it is often less dramatic than the fixed stupor seen in extreme cases. Experts say catatonia’s more incremental progress in autism means it can be missed. Mother-of-three Tracey Mears, from Northumberland, watched 23-year-old son Ryan [both pictured] gradually regress into catatonia around eight years ago. 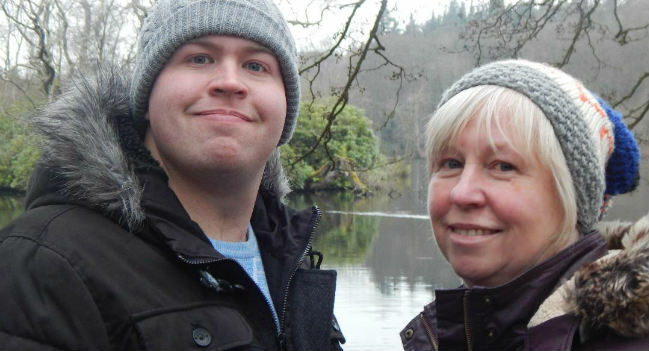 Mears, 56, took Ryan, who was diagnosed with autism as a two-year-old, to one health professional after another, but saw his condition dismissed as hormonal or typical teenage behaviour. Mears, who cares for Ryan with husband Derek, 64, eventually identified Ryan’s catatonia more by accident than design. Living in Cornwall at the time where she chaired a branch of the National Autistic Society (NAS) she took Ryan along to a training session. During the session an out-of-county professional mentioned catatonia and Mears soon realised her son “ticked every single box”. Having watched her two other children Adam, 25, and Sam, 22, go through adolescence and come across countless other people with autism Mears knew there was more to Ryan’s problems than hormones. Ryan began speaking in a whisper, until the language he had stopped altogether and his reactions and ability to take in information slowed. It became difficult to motivate him to get out of bed and interest him in activities. Ryan, who though he has the mental age of a three year old can master complex jigsaws, experienced involuntary movements and struggled to cross thresholds like doorways. At its worst Ryan was struggling to lift his hand to his mouth to eat and had to be fed by his mother, who became concerned as she saw her son lose “loads of weight”. Eventually health authorities in Cornwall agreed to pay for outside expertise. Clinical psychologist Dr Amitta Shah, one of the UK’s leading authorities on catatonia in autism, was brought in. Mears admits her family’s approach to treating Ryan’s catatonia was arrived at by years of “trial and error”. The family took him out of his special school a year early, kept him at home and concentrated on quiet activities as Ryan often experienced sensory overload. A barking dog could set off a meltdown in the usually placid Ryan that would see him shake and struggle to move. Out went computer games and DVDs and in came soft music, jigsaws, books and an exercise bike in an attempt to provide low-level stimulation. “We just kept him really calm and tried to lower his anxiety levels,” added Mears. Ryan’s parents, who are both now retired after running a holiday park in Cornwall, have doubts as to whether he will ever fully recover. But Mears says her son’s anxiety levels are now much better. She says Ryan is now doing “loads more” activities, like long walks and shop visits as well as enjoying family holidays. Now Mears, who manages Ryan’s catatonia without medication, says her son “gets really excited” about life after feeling like she had “lost him for a few years”. She struggles to identify the factors that might have triggered Ryan’s catatonia. But she believes his adolescence, struggling in school and sudden changes that were difficult to explain, like his siblings leaving for university and the death of his grandfather may have all played a part. Shah believes the condition is more common in autism than the 12% to 18% prevalence suggested by research. As awareness is increasing, many more cases are coming to light, including young children and those with high functioning autism and Asperger syndrome. Shah, who has co-authored several papers on catatonia and autism, says the condition still goes undetected in the NHS. In the past catatonia has been associated with conditions like schizophrenia and professionals can struggle to recognise it in autism, particularly in its milder form. The condition affects speech, movement and the ability to turn thoughts into actions. Early signs include slower movement, hesitations, loss of speech fluency and deteriorating skills. In autism causes can include side-effects of medications like antidepressants and antipsychotics and stress and anxiety. It often occurs in teenagers after they leave school when structure suddenly disappears or they find themselves in environments where their needs are not understood. Adolescence itself, and the hormonal changes it brings, can be a factor, says Shah. Bereavement can also trigger catatonia where someone is non-verbal and has no other outlet for grief. In its most severe form where people lose the ability to move, even down to chewing and swallowing, it can be life-threatening. When the condition occurs mildly and it’s picked up early people can recover, but the risk of relapse remains. Shah is not an advocate of the use of high dose medication and electric shock treatment (ECT) to treat catatonia in autistic people. However, she concedes that in the most severe cases where catatonia is life threatening, it may be appropriate to use these drastic treatments as a last resort. Shah advocates a psychological approach that does not rely on medication, but instead uses a comprehensive assessment working with carers. Her approach reduces any underlying anxiety, uses prompts for movement problems and increases activities the person enjoys. Dr Dirk Dhossche, who has completed research work with Shah, says catatonia does not have to be lifelong. Mississippi-based Dhossche knows of US cases where catatonia was either resolved or prevented from developing by either minor tranquilizers like benzodiazepines or ECT. Dhossche said though treatments like benzodiazepines and ECT for severe cases are “intensely unpopular and stigmatised” they “bring relief to selected cases”. For further information contact the NAS Lorna Wing Centre on 020 8466 0098 or their helpline on 0808 800 4104. Image: Tracey Mears with son Ryan, who began to experience the symptoms of catatonia around eight years ago.